Designed to free craftsmen from dependence on fossil fuels, the Whitlox Wood-Fired Forge is optimized for burning raw wood or charcoal. The deep firebed has sloped sides, making fire management effortless. An innovative tube within a tube draft design offers dial select precise air supply control. The firebed itself has a moveable divider to restrict the size of the fire to only the needed area, conserving fuel. Remove the brick from in front of the divider and you can lay a long bar across the fire unimpeded. 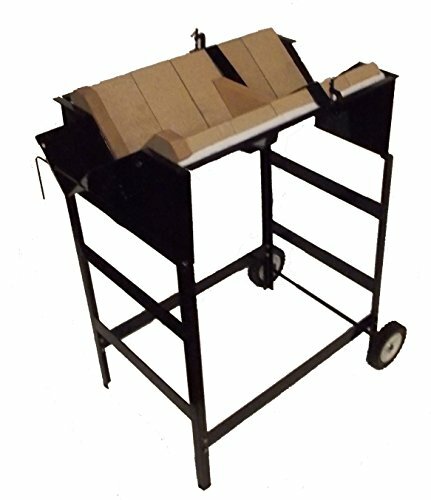 The 24x18x9" forge body is constructed of welded eleven gauge steel, nearly 1/8" thick. The wheeled stand makes your forge portable: just wheel it out for use and put it away when your project is completed. The stand is 28" high, built of 1/8" 1"x1" angle. Included is a cast aluminum Zomax handcrank blower which mounts on the left side of the forge with an included bracket and ducting. If you have any questions about this product by Whitlox, contact us by completing and submitting the form below. If you are looking for a specif part number, please include it with your message.